Hi-visibility Premier Sun-coast Parkway and County Line Road Commercial location. Utilities to site. Out Parcels or entire parcel available at this time. Approvals for 375,000 sq. ft of commercial and 75,000 sq. ft of Professional office. 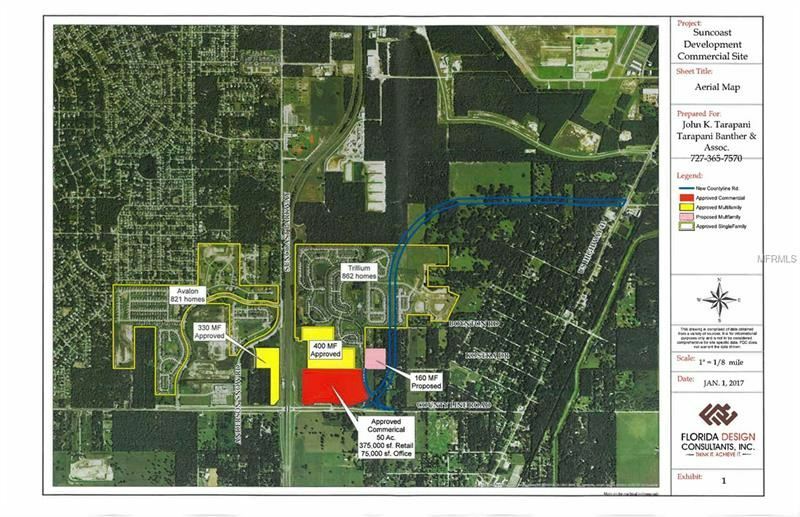 Property is in a high volume new housing growth area and is on the corner of the new County Line Road realignment which is the planned east west arterial from US 19 to I-75. Pulte Homes is in final phase of a 900 unit single family subdivision. Avalon is another 900 unit subdivision one mile west, Southern Hills and Hernando Oaks a short distance north on US 41. Owners will construct entry way and frontage road for an outparcel buyer/user. Size of out parcels is flexible at this time. The approximate monthly Principal & Interest payment for this property would be $31,397. This payment is based on a 30-year loan at a fixed rate of 4.12 % with a down payment of $720,000. Actual lender interest rates and loan programs may vary.